Har gow (har gau, har gao, ha gao) is a Singaporean dim sum favorite. 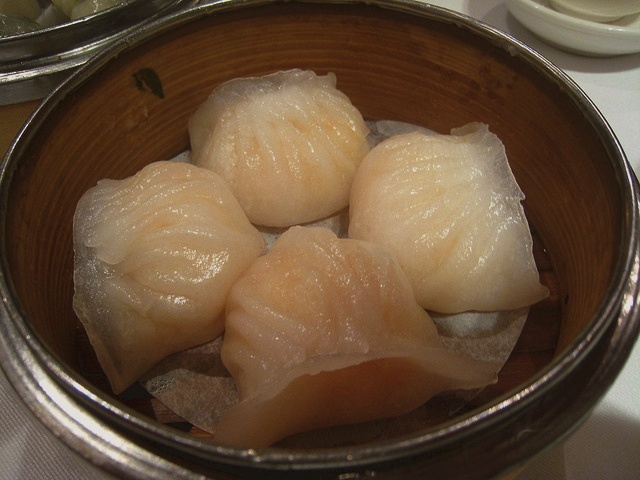 Har Gow are those tasty shrimp dumplings with the translucent wrappers served at Chinese dim sum. The main trick to making Har Gow is handling the dough, which is very sticky and can break apart easily. This dish is said to be the one that the skill of a dim sum chef is judged on. Try these step by step amazing dumplings recipe let me know what you think in the comment section below. Enjoy! Related Recipe – Tasty Korean Dumpling (Mandoo), How to make Siew Mai. Remove all of the shells and tails from the shrimp. Devein them if they are not already. Once the shrimp are clean, chop them into tiny pieces and place them in a bowl that has a tight fitting lid. Drain and mince the bamboo shoots. Then mix them in with the shrimp. To the shrimp mixture add the shao hsing wine, sesame oil, stir fry oil, sugar and salt. Mix everything together thoroughly and then add in the cornstarch. Place the shrimp mixture in the refrigerator and let it marinate for an hour. Once the shrimp mixture marinates, prepare the skins. Mix the wheat flour with the vegetable oil. Then boil the cup of water in the microwave. Once the water boils, quickly add it to the flour mixture and stir until everything is evenly combined. It should form a dough like consistency. Then let it sit until it cools. After the dough cools, roll it into a long roll and cut it into 30 equal pieces. Remove the shrimp filling from the refrigerator and set up a work station to fill the har gow. Oil a work board or plate and a rolling pin and oil the bottom of the steamer tray as well. An aluminum steamer is best suited for this recipe. Fill the bottom of the steamer with hot water and heat it on high. Then take one of the dough pieces and roll it into a ball. Set it on the oiled board or plate and flatten it into a circular shape using the rolling pin. Pick the skin up and place about a teaspoon of filling in the center. Then using each of your fore fingers, pleat the top of the skin using your thumb to curve the bottom of the skin around the filling. This is a bit difficult and if you wish you can simply pinch the dumplings closed forming a half circle. After each one is finished, place it in the oiled steamer tray. Continue until all of the har gow are complete. Then steam them for just about 5 minutes. Remove them from the steamer and place them on plates to be served. Makes about 30.